We provide an exclusive assortment of optimum quality range of Tensile Car Parking Sheds that are available in several sizes, thicknesses and lengths at reasonable prices. To manufacture this range as per the international standards, we have employed well-qualified and experienced professionals. In addition to this, we offer customizable range of these sheds as per the demands of customers. We ensure that the products are delivered within the stipulated time-frame. 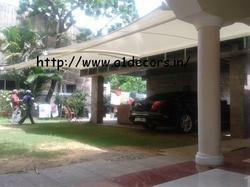 We are the leading organization involved in offering very high quality Car parking Sheds. These sheds are available in various designs, sizes, shapes and specifications. Further, we offer these sheds at market-leading prices and ensure that the products strictly adhere to the international standards and guidelines. Looking for Parking Sheds ?